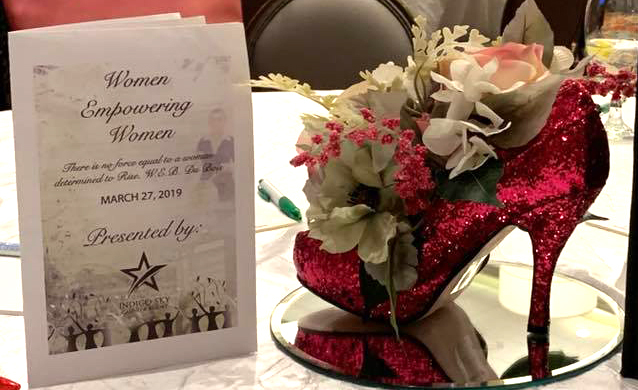 People's Bank of Seneca was Proud to Sponsor the first annual Women Empowering Women Conference held at indigo Sky Casino on March 27, 2019. People's Bank of Seneca is Proud to Sponsor the new fencing around the Seneca Baseball/Softball fields. 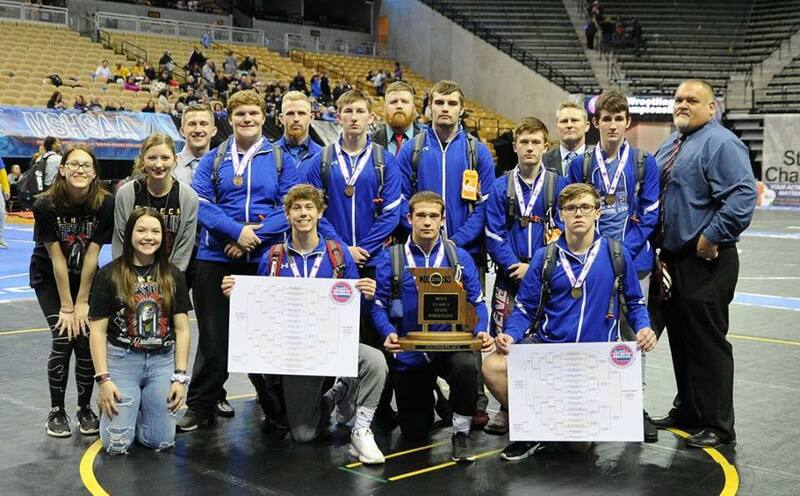 People's Bank of Seneca was proud to sponsor the Seneca High School Wrestling team's trip to State! Individually they took home a 1st, 2nd and two 4th place medals! As a team they placed 9th! 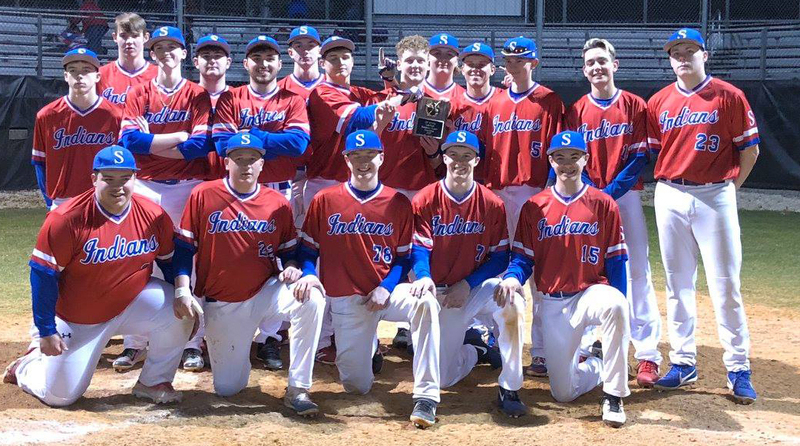 Great job boys! People's Bank of Seneca is very excited to start renovations on our Seneca location! People's Bank of Seneca is Proud to help bring flights from Joplin to Chicago to Joplin Regional airport. People's Bank of Seneca took cookies for Police Appreciation Day to Joplin, Seneca, and Eastern Shawnee Tribal Police Departments. Along, with Newton County Sheriff's office. People's Bank of Seneca is proud to be a part of local schools and sponsor the 2019 Seneca District Basketball Tournament. People's Bank of Seneca is proud to sponsor the New Harry M. Cornell Complex! Originally incorporated as the Ozark Artists Guild, George A. Spiva Center for the Arts has presented visual arts experiences to the four-state region since 1947. George A. Spiva – businessman, philanthropist, and lover of the arts – helped establish Joplin’s first art center in 1958. Founded on the belief that opportunities in the arts should be available to all, the Center continues to flourish through the generosity of members and friends who share that vision. First located in the Zelleken House at 4th & Sergeant, Spiva moved to the campus of Missouri Southern State University before relocating to its current home in the historic Cosgrove Building at 3rd and Wall in downtown Joplin. The Zelleken House was built in 1893 by Edward Zelleken. He died in 1920 and left the house to his daughter. The Ozark Artists Guild opened an art center there in 1958. In 1967 Spiva Art Center moved to the Fine Arts Building at Missouri Southern State University in Joplin, MO. People's Bank of Seneca was proud to sponsor and participate in the Seneca 2018 Christmas Parade! Missouri Southern State University on Thursday unveiled plans for its new video board for Fred G. Hughes Stadium. The board will be 63 feet high and 90 feet wide — the third largest in all of NCAA Division II athletics, according to MSSU officials. A scoreboard will be stripped across the top, with a full-color video display beneath it. The video display will be 30 feet high and 66 feet wide with more than 718,000 pixels. A built-in sound system is also in the works. The $1.3 million project was funded by private donations on the video board, a Nevco product. Scott Boudreaux, president of the Missouri Southern Foundation board of directors, said at Thursday's press conference inside the North End Zone Facility that the board will be ready for use in time for the Lions' first home football game on Sept. 8. "No tuition dollars or state funding is being used for this project," Boudreaux said. Major corporate donors include Freeman Health System, Liberty Utilities, Missouri Eagle, People's Bank of Seneca, PepsiCo and R.E. Smith Construction Co.
"The athletic expression is, 'go big or go home,'" Boudreaux said after the press conference. "Our student athletes are worthy of being highlighted on game day in a positive and creative manner." 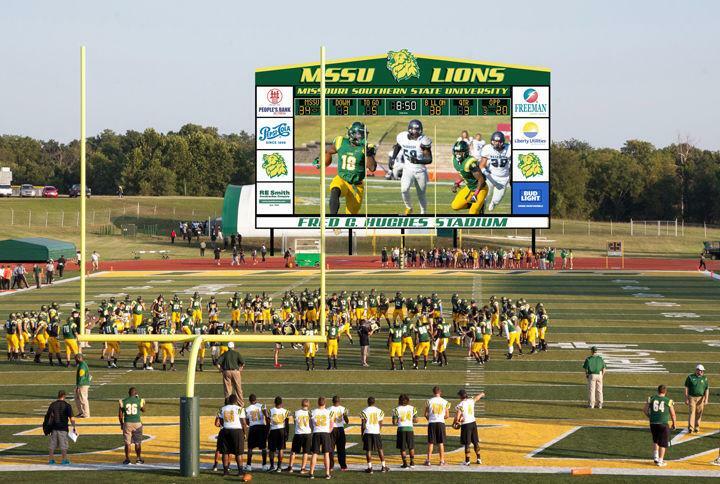 MSSU's incoming video board will be the third largest in Division II and second in the MIAA. Grand Valley State leads the way with its board spanning 78 feet high and 138 feet wide. It was built ahead of the 2016 season. In the same season Missouri Western showed off its large video board at a display of 38 feet high and 90 feet wide, passing Pittsburg State's 'Jungletron' as the conference's largest. PSU's video board, which debuted in 2008, is 40 feet tall and 70 feet wide. "It is a great day," MSSU head football coach Denver Johnson said to the crowd. "I’ll tell you, we’re geeked up and excited about this, and it’s great to see so many people here and involved. "I got up this morning and had a sense that this was a tipping point type of day for our program." The university also plans to use the video board for public movie nights and other community events.